There are many parallels between cooking a cake and creating a good compost heap. For a cake, the key factors are ingredients, method, timescale and temperature; to produce good garden compost these are just as important. 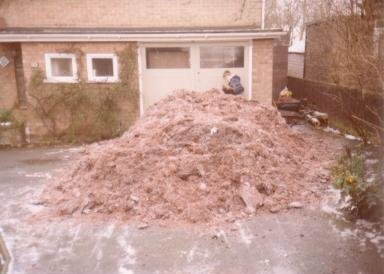 Firstly we have to consider WHERE the heap should be. 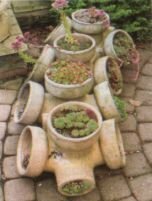 Many people hide the heap away at the very end of their garden, but for a large garden that may mean long trips to discard possibly small volumes of waste. Similarly when the heap is mature, it is best if it is close to where it is to be spread. One compost heap, although far better than no compost heap, means that the heap has to be destroyed when some is needed to be spread on the garden - aim for a minimum of 3 heaps, preferably all next to each other, so that the compost can be turned from one into another. In warm weather a compost can go through the entire cycle from raw material to spreadable compost in only a few weeks, but during winter it will take several months. 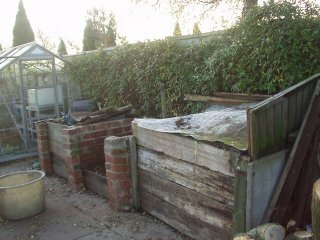 The number of compost heaps is thus dependant partly on the time of year that the heap is built. The word "heap" when applied to a compost is, I believe, misleading, since it implies that the raw ingredients can be dumped anyhow and the resulting mound will miraculously turn into compost (it may well, but I don't have the time to spare, waiting for it). The size is surprisingly critical. Too small, and therefore not enough raw material, means too little heat will be generated. Too large, and the effort involved in turning is likely to put all but the very athletic gardener off the idea. I find that a size of 4'x4' or 5'x3' is about right. Preferably it should be made from brick or wood and should allow planks to be slotted into the front to make it easy to remove or to turn it. If a large volume of leaves is collected in the autumn then a still larger compost is manageable (because it is relatively light in weight) and it is worthwhile to speed the whole process up by mixing an equal volume of grass in with the leaves, the following summer. A good compost needs moisture and air, the bacteria will then thrive and will generate heat. It is important that the heat is not lost, or the process will take much longer than it really needs. I put as varied a mix of raw materials on the composts as possible, including kitchen waste, small roots and weeds these break down okay when mixed with relatively large volumes of soft green material (such as grass). The key word is mixed; too thick a layer of any one material and the process will be slowed down. If you have excess grass it is essential that it be mixed with other material to keep the air in. The best thing I have found for this is partly rotted straw (discarded bedding from a nearby stables). Any prunings from the borders that are more than about 3mm thick, I dump on the lawn and then shred using the rotary lawn mower. This has the added advantages of automatically mixing in some grass and of causing many cuts and bruises in the material, which allows the bacteria in far more quickly. I also use an electric shredder for long straight prunings - but the shredding process is a lot slower than using the lawn mower and it is not suitable for roots since any soil will blunt the blades. It is worthwhile to get prunings onto the compost as soon as possible - if you leave them a week or so before using them they will become dried out and compost much more slowly. The composting process is greatly speeded up if the heap is sufficiently damp, since moisture allows the bacteria to spread. Unless the new material is particularly soft be prepared to water it, once it has been added to the heap. But beware of over-watering an existing heap and so cooling it down with the cold water. 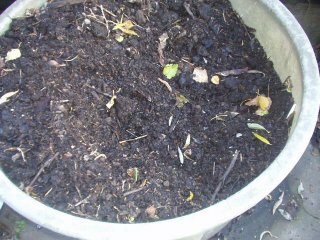 I do not use any compost "accelerators", but often sprinkle a spadeful of soil onto the heap, the natural bacteria in the soil is sufficient to start the composting process. I also use "recycled" beer, which has lots of bacteria in. Each time material has been added to the heap, it is very important to cover it with several layers of carpet or similar insulating material. The temperature can reach over 150°F and even on a warm summer night there is going to be much heat loss, unless it is well insulated.